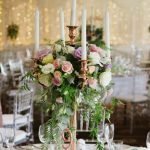 The team at Waterside Events are award winning specialists when it comes to making your wedding day the most special day it can be. Take a look at the pictures from this recent Hamptons inspired wedding theme here at the Club. The Waterside Events Space is versatile and can accommodate long or round tables. The room features stunning water views with enough space for dancing, staging and break out areas on the balcony.